Cheesy pasta | Food E.
The weather in New York suddenly turned cool which immediately puts me into comfort food mode. What’s better than a chilly Sunday tucked inside with football on TV and a plate of creamy, cheesy pasta in your lap? As much as I love summer fruit, fall is definitely my favorite season for food. Bring on the winter weight! *Note: this recipe can be made with any spaghetti/fettuccine/linguine type pasta, but it would be best with tagliatelle. 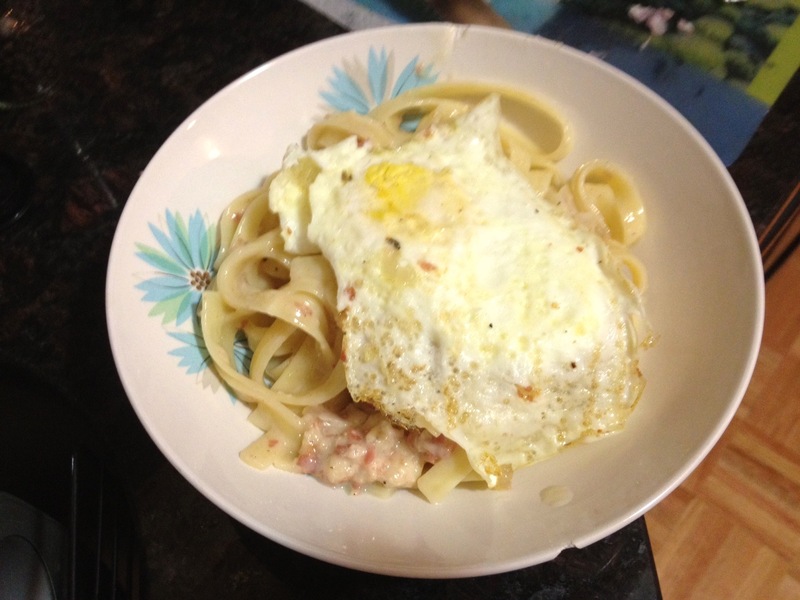 I made this first with tagliatelle and a second time, as pictured, with fettuccine. If you can find tagliatelle, use that but most standard grocery stores don’t carry it. stirring frequently, until the pancetta is crisp and golden, about 10 minutes. While the pancetta is cooking, add pasta to the pot of boiling water and cook according the instructions on the box. Remove the pancetta from the pan once it’s crisped up and add the shallots. Cook until the shallots are tender, about 5 minutes. Drain off any excess fat. Once the pasta is cooked, drain the pasta through a colander, reserving 1½ cups of the pasta cooking water. Add 2 Tbsp of the butter and black pepper to the shallots and pancetta. Stir constantly and cook for 1 minute. Add 3/4 cup of the reserved pasta water and bring to a simmer. Add the mascarpone and whisk until incorporated. Add the Parmesan and Pecorino cheeses, stirring until the cheese is melted. Add the pasta and heat until the pasta is cooked through, adding more pasta water if necessary. Season with additional pepper and set aside. Make the eggs: In a medium skillet set over medium heat, melt the remaining tablespoon of butter. Carefully add the eggs and fry until the whites are set and the yolks are still runny, about 4 minutes. Divide the pasta between two bowls and top each with a fried egg. Sprinkle with parsley and serve. I know, this is not the most appetizing picture ever. But it’s better then nothing! It’s a blessing and a curse, guys. I am phenomenal at making basic comfort foods. I know, I know. Humble, too. You might be thinking, “How in the world is this a curse?” Because in my house, that’s all I ever get asked to make. The below dish is a perfect example. It’s not groundbreaking cuisine here, folks. It’s just a different sauce. 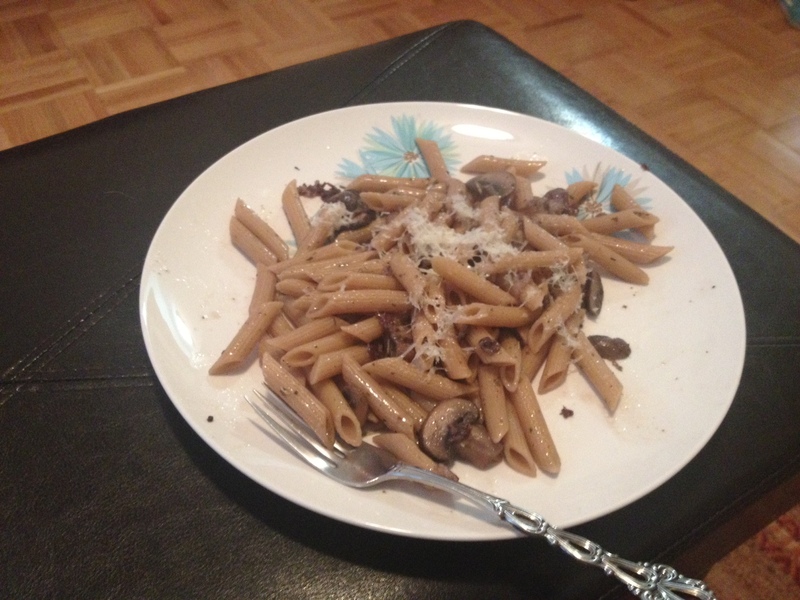 But after I made it The BF said, “You gotta make more stuff like THIS!” Ah… more cheesy pasta. Noted. In a large sauce pan, combine the beef broth and the wine over medium/high heat. Let cook for 18 – 20 minutes until the liquid is reduced to one cup. In the meantime, heat 1 Tbsp olive oil over medium heat in a LARGE pot (the entire pound of pasta will eventually go into this pot so keep that in mind when choosing a size). Add mushrooms and season with a bit of salt and pepper. Cook until softened, around 6 – 8 minutes. Transfer mushrooms to a plate. Add pancetta to the large pot that your mushrooms were in and saute until the pancetta is crispy and brown, around 10 – 12 minutes. Drain off excess fat. Add wine reduction, butter, and herbs to the pot. Simmer until liquid thickens slightly, around 5 minutes. Stir in mushrooms. Add cooked pasta and 1/2 cup of the parmesan cheese to the mushroom mixture. Cook over medium/high heat until the sauce really thickens and coats the pasta, about 7 – 9 minutes, adding a bit of pasta water little by little if the sauce is dry. Plate pasta and top with remaining cheese.